In my previous post I wrote about predicting the market or stock moves and that I do not do it and why. Yet people keep asking me how do I select stocks to trade and how do I trade them when I do not predict their moves and do not study them. I understand their concern as I was in the same boat. I too wanted to know what the next move will be and why a stock is doing this or that. But I no longer care for that. I watch and follow the stock. I know what the Wall Street’s concerns were and why a sell off occurred in the past if you ask me. But I do not search for that information in order to predict the next move, make a trade decision and trade based on it. Remember, everything you have ever read about the stock is in the past. And as every disclaimer says, past performance is not a guarantee of a future one. What you have ever read about the stock already happened and it may or may not have an impact to its future. Take STX stock. In April 2016 the stock fell from $36 a share to $18 a share on a bad guidance on hard drive sales because of slowing PC sales. Today, in December, the stock is trading at $36 a share again (and at some point it was at $41 a share). If the past and the guidance was so bad that it needed a sell off of the stock, why is it trading back up at $36 a share six months later? Wasn’t it suppose to be a disaster for the company? And how come the past poor hard drive performance didn’t affect the future? So I keep myself informed. But I do not do it to make trading decisions. In today’s post I will try to describe an entire process of trading strangles. I do have a few rules and criteria I use to trade. None is based on predictions though. If you follow my blog you already know that I trade options and invest into dividend growth stocks. But when trading options I primarily use dividend growth stocks as underlying. The reason is simple. If I get ever assigned to a stock when selling puts, I keep the stock, collect dividends, and start selling covered calls. If I have to hold a stock, I want the dividend for it to maximize my potential profit. So the very first step you want to do is to create a watch list of dividend stocks. You can browse the internet and find for dividend stocks. You can go to “Investing Links” on my website on the right side of the blog and there are many other dividend investors listed, such as Dennis McCain, FerdiS, Keith Park, Dividend Growth Investor, Mike, or Dividends 4 Life to just name a few. Then browse their blogs and look what they are buying, what stocks they are talking about. And there you will find ideas of stock you can use. Put those stocks in your own list. When you are done, you should end up with 30 to 40 dividend stocks. Or more if you find more. There is no limit. Do some reading about those stocks and learn how to select good dividend stocks. Creating a watch list is just a first step. It still will not tell you which of those stocks you will be trading. I browse through my watch list to choose stocks which meet my trading criteria. My criteria change time to time, sometimes the stocks change a bit so they fit my criteria. When they do, I add them to my narrower list. If they no longer meet my criteria I remove them from my narrower list back to the broader list. Before we review how I evaluate the stocks whether they meet my criteria or not, here is my strangle strategy and the way I build it. 1) I trade weekly options using the selected underlying stocks and trade 7 – 10 days to expiration. 2) If opening a new trade on Monday or Tuesday I open a trade with the same week (Friday) expiration if collected credit is equal or larger than 0.40 per strangle. 3) If opening a trade on Wednesday to Friday I open a trade with next Friday expiration. 4) I trade strangles using near the money (one strike out on each side). 5) If I have a bullish bias (I will explain later) then I open puts near the money or at the money and calls two to three strikes out. 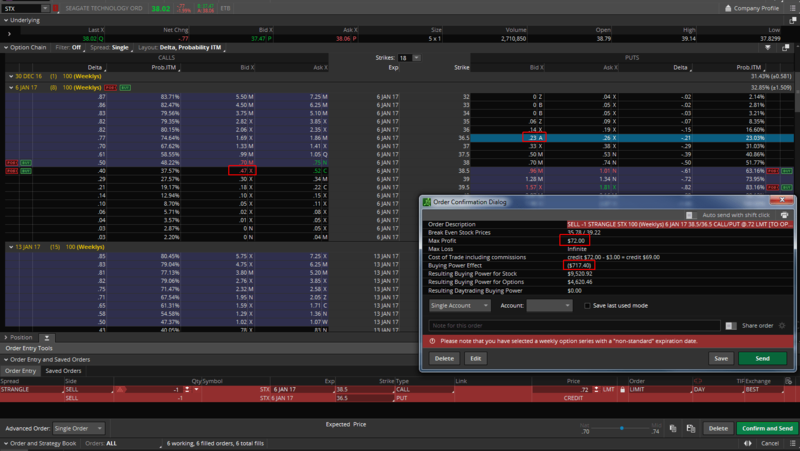 If I have a bearish bias I open calls near the money or at the money and puts two to three strikes out. 6) As soon as I place a new trade I place a buy back order to close the trade for 0.05 debit for each leg separately (one BTC order for put and one BTC order for the call). 7) During the week as the stock moves one or the other direction (and I really do not care which direction it is), the untouched leg (or further away out of the money) becomes close to worthless and it is bought back for 0.05 debit. After this happens (and never sooner) and the untouched side of the trade is closed, then I can roll the touched side away. 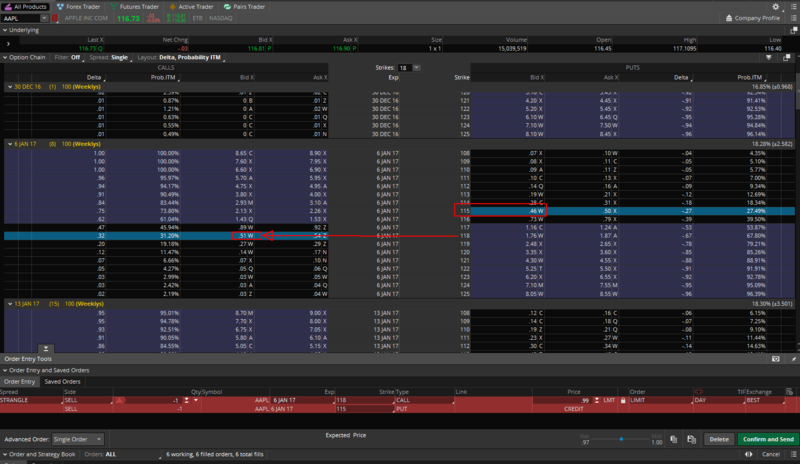 8) If the touched side is still OTM or near the money I wait until expiration as the stock may move my direction and the touched side may expire OTM or be bought back for 0.05 debit. If the touched side is deep ITM or it is apparent that it won’t recover by expiration then I do not wait and roll right after the other untouched side is closed. 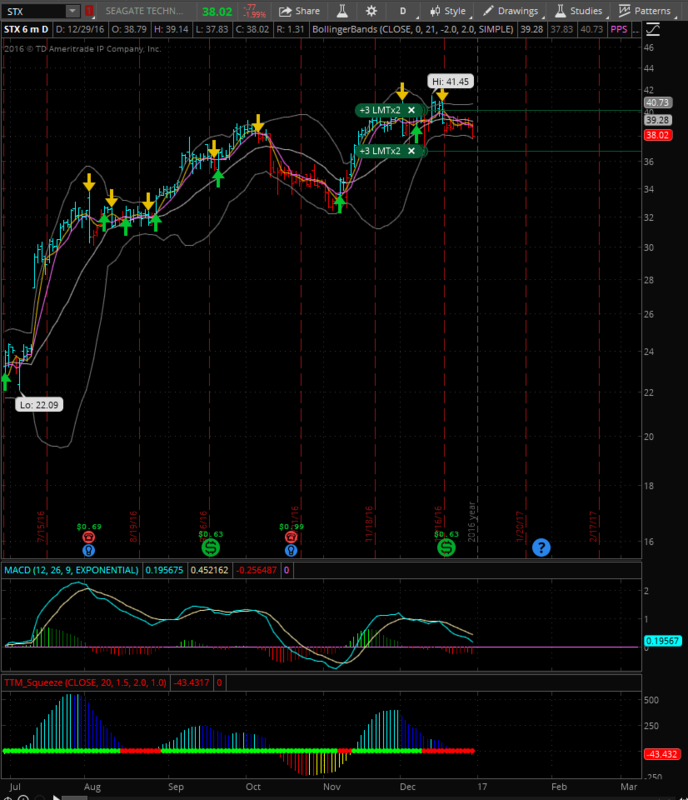 For example, I sell a strangle against STX trading at $36 a share with 34 put and 38 call. The stock moves down to 34. The calls becomes worthless and I buy them back for 0.05 debit. This allows me to roll endangered puts. Since the stock is at 34 I decide to wait until Friday expiration. On Friday morning the stock moves sharply up to 37.50, the puts become worthless and get closed at 0.05 debit. 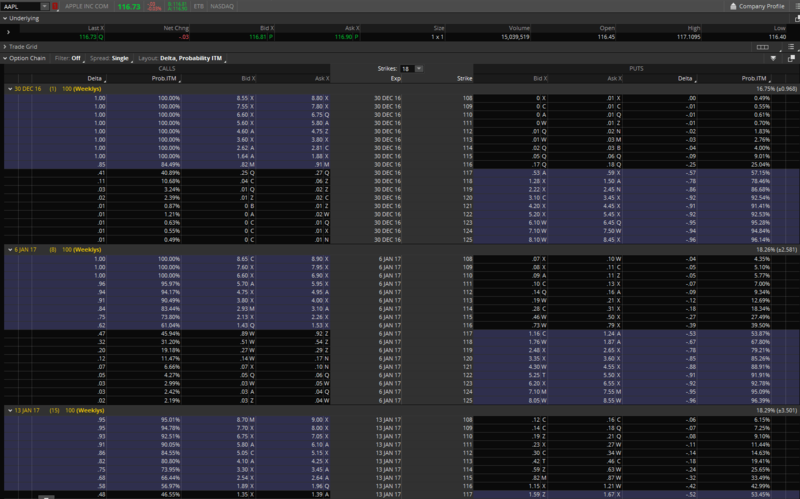 9) However, if the outcome was different and the stock moved down on Friday morning from 34 a share to 33 a share then I would roll the puts into the next week, down from 34 strike to 33 strike and sell a new 35 strike calls against it. 10) I always try to roll into the next week only (rarely two weeks if there is no way to roll for credit) and it must be a credit trade. 11) The new trade roll will either be a new strangle, straddle, or inverted strangle (depending on the touched leg position at expiration – if ITM but near the money, it will be a strangle or straddle, if deep ITM it will be an inverted strangle). 12) If the stock ends in between the two strikes and both get liquidated for a profit, then the new trade will be a new strangle. Now that you know how I build and manage the strangle trade, let’s review step by step how I evaluate good candidates for trading using my broader dividend stocks watch list. Let’s pick one stock ADP. The very first thing we can spot is that ADP doesn’t offer weekly options. There fore it doesn’t meet our criteria and it is excluded. We do not need to evaluate any further. From the chart above we can see that Apple (AAPL) offers weekly options (it passes test #4). 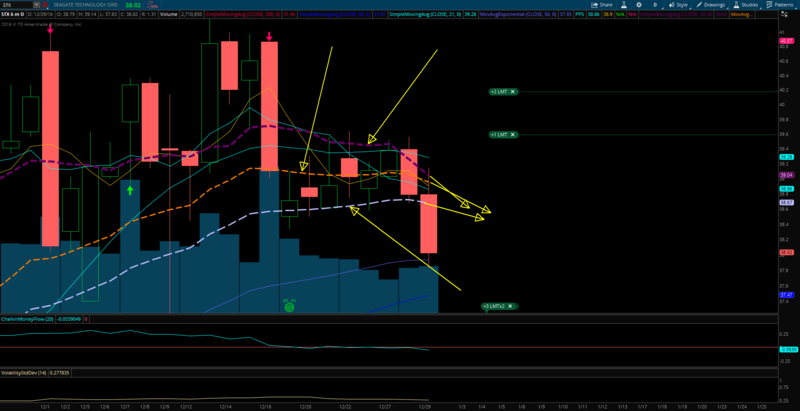 We also know that AAPL pays dividends (it passes test #1). To evaluate other criteria I need to construct the strangle as described above. As you can see on the picture creating this strangle I would get 0.99 or $99 per contract. Thus this passes the test #3. 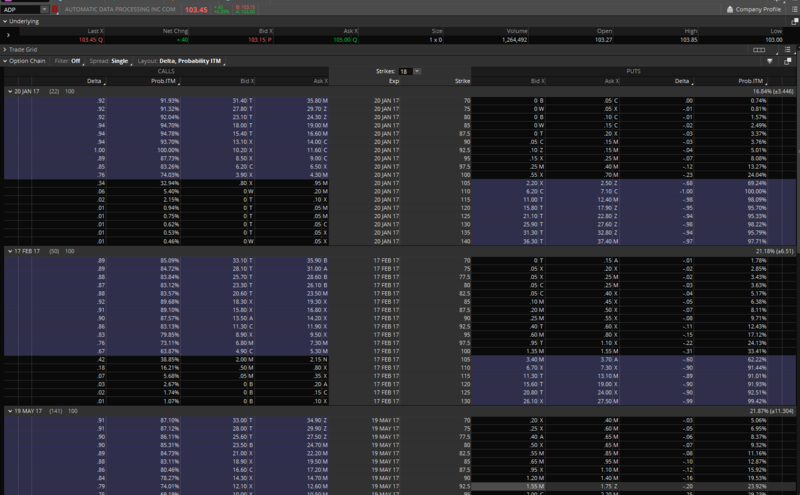 As you can see this trade would require $2,221.70 margin requirement. This stock doesn’t pass the test #2 and is excluded from my trading list. Now I have a trade candidate. I do this with all stocks from my broad dividend stocks and evaluate them. Then I add those which pass to a smaller list. Above I mentioned that sometimes I adjust the strangle based on the bearish or bullish bias. If I feel bullish, I open a new trade with puts closer to the money and calls farther away from the money and vice versa. Here is how I evaluate that. I use a simple chart with a few oscillators on it and moving averages. I keep it simple. Let’s take a look at STX stock. I use two types of charts to quickly look at it to determine whether there is a bullish or bearish bias. I use a Person’s Pivot Study (PPS) indicator. If a bearish signal is fired it charts a yellow down pointed arrow. If a bullish signal is fired, it charts a green upward pointed arrow. In the chart above you can see that STX has a bearish signal. Then I use a MACD oscillator. I do not use its histogram. I only use the fast and slow lines and I look at what direction they are pointing. In the chart it they point down and there is no indication that they would be bottoming and reversing. So STX is bearish. Lastly I use a TTM study. I use it in lieu of MACD histogram as it shows better the direction of the move. Here it also points down. But since it is already at the base line (made of the green and red dots) that indicates that we may be bottoming. The stock may not move under the line but reverse and move back up again as it did in August 2016. However, until this is clear I have a bearish bias. In this chart I use moving averages only. I zoomed the chart as close as possible so it is clear to see them. They are shown as dashed lines. I use 10, 20 and 30 days averages. I marked them with the yellow arrows. I look at their direction and trend. From the chart you can see that they are no longer pointing up, they are moving down and they are about to cross each other. I also added smaller yellow arrows projecting the trend. It is visible that the 10 day average (violet dashed line) is about to cross down the 20 day average (orange dashed line) and both are heading towards the 30 day average (light blue dashed line). Again, this is a clear bearish bias. 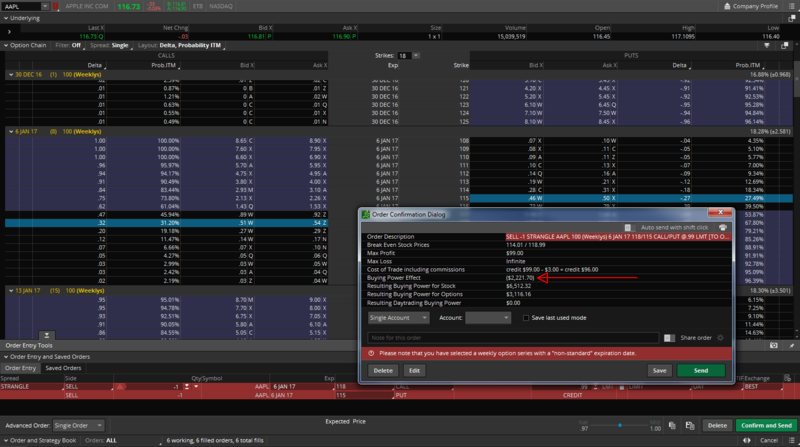 Because I have a bearish bias I would try to place my puts as low as possible and go for 36.50 put strike (three strikes out) while opening 38.50 call strike (at the money). By doing so I still would collect $72 credit (passes #3 test), the margin requirement is $717.40 (passes test #2) and I am giving the trade more room to go lower. Of course, the stock may reverse next day and go back up. That would endanger my calls which will be in the money right away. Will that happen? I do not know and I do not care. I trade only 7 to 10 days contracts thus giving the market little time to go against me for a prolonged period of time if that happens. 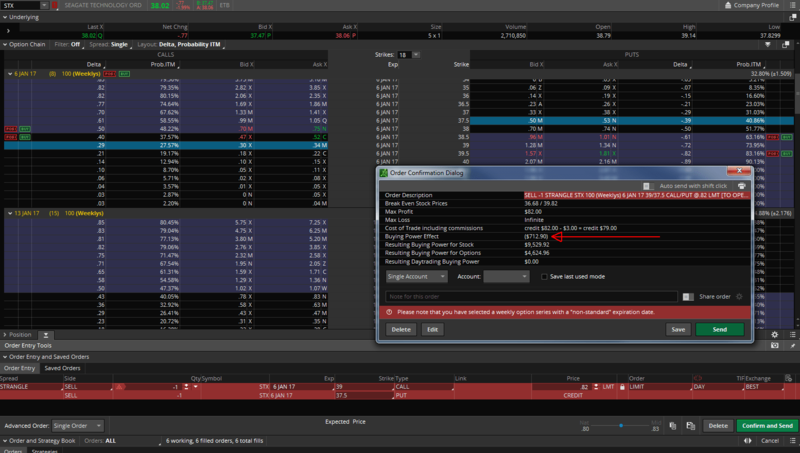 And if that happens, my puts are so far away that they lose value quickly allowing me to roll the trade. In my next post I will write a few words about trade adjustments what I do when the stock goes in a wrong direction.